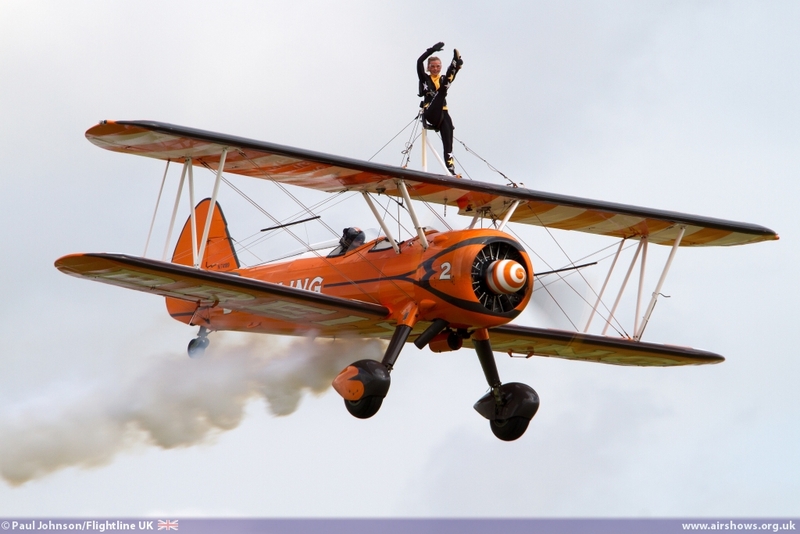 RFC Rendcomb, home of the AeroSuperBatics and the Breitling Wingwalkers, was the venue for a very exclusive charity airshow in Mid-May. 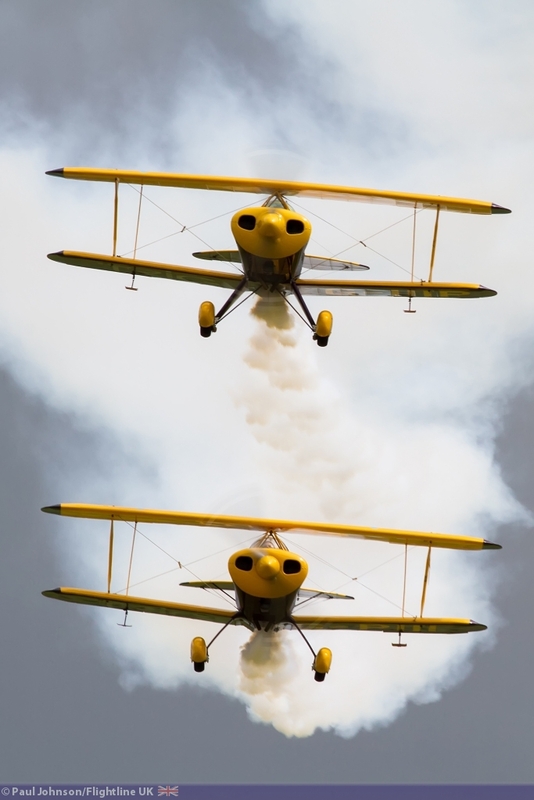 Organised by Vic and Anne Norman, the show featured many of the best known display acts from the UK and Europe with aircraft ranging from beautiful 1930’s airliners to the latest aerobatic marvels and jet formation teams. 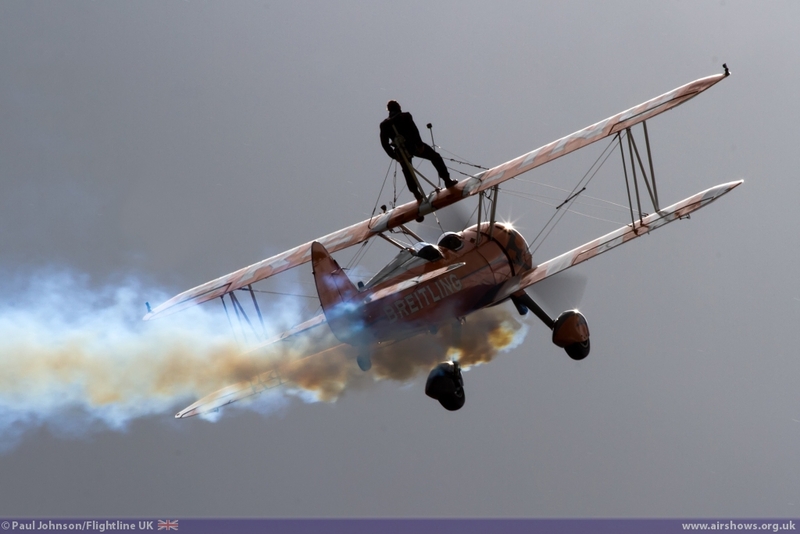 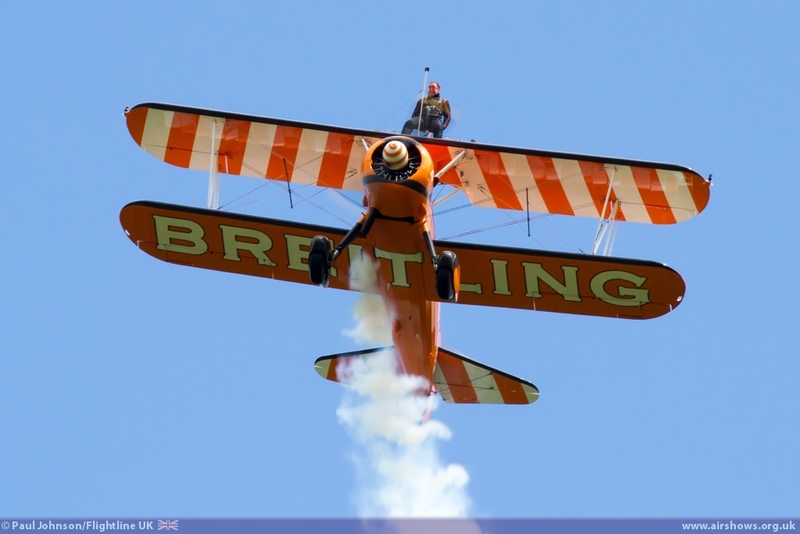 The show even featured a high octane twist with a guest wingwalker taking to the skies on the wing of a Stearman. 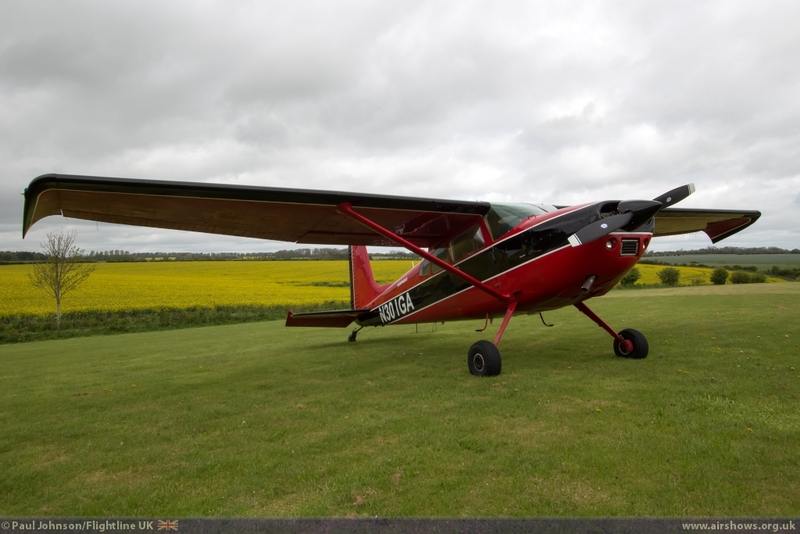 Aerodromes do not come more idyllic than RFC Rendcomb; positioned on the rolling Cotswolds hills above Cirencester the airfield oozes character with its original wooden hangars and stone walls surrounding the open grass airfield. 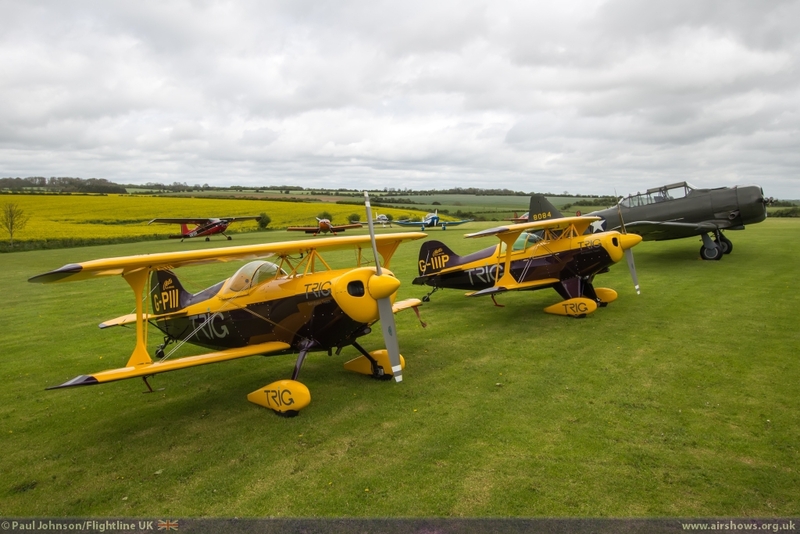 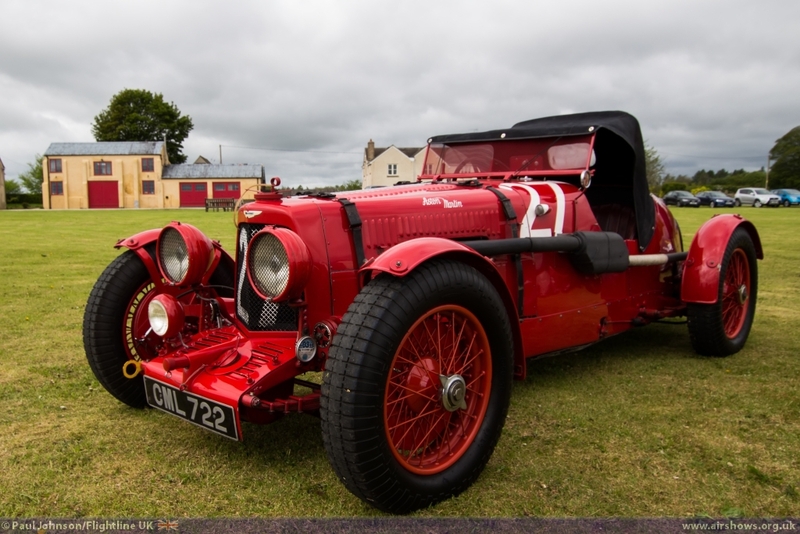 The airfield is not only home to the Boeing Stearman of AeroSuperBatics but also many other classic and vintage aircraft plus Nick Mason’s quite incredible car collection. 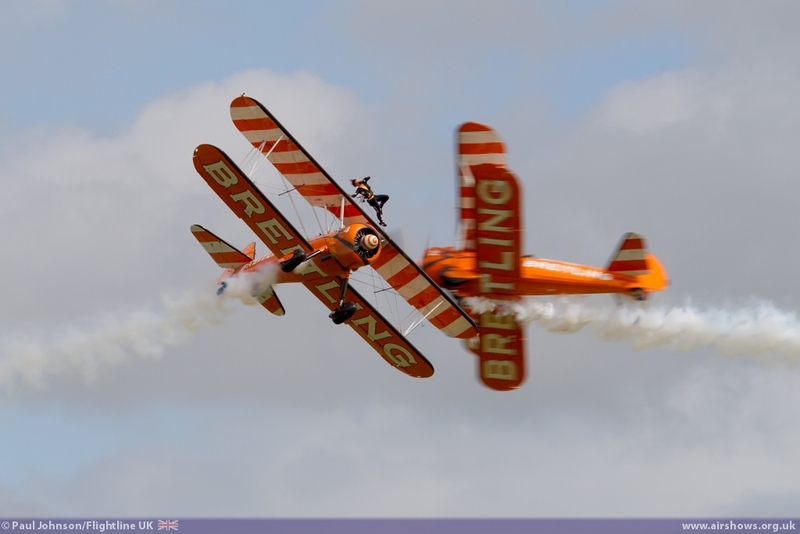 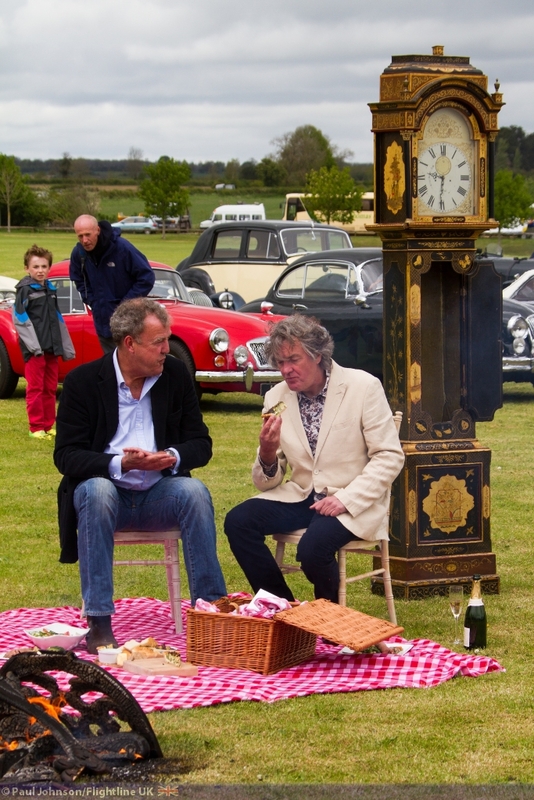 Though Rendcomb does not hold any public airshows, the airfield does occasionally hold some very exclusive charity events. 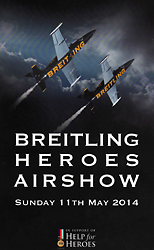 In recent years these have supported many charities, and this occasion Help for Heroes was the worthy cause to benefit. 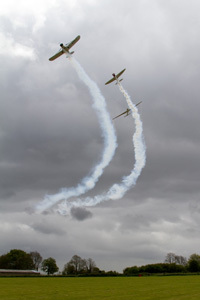 The weather proved to be something of a challenge for all those involved in the flying displays with some strong winds and some sharp showers covering much of the UK. 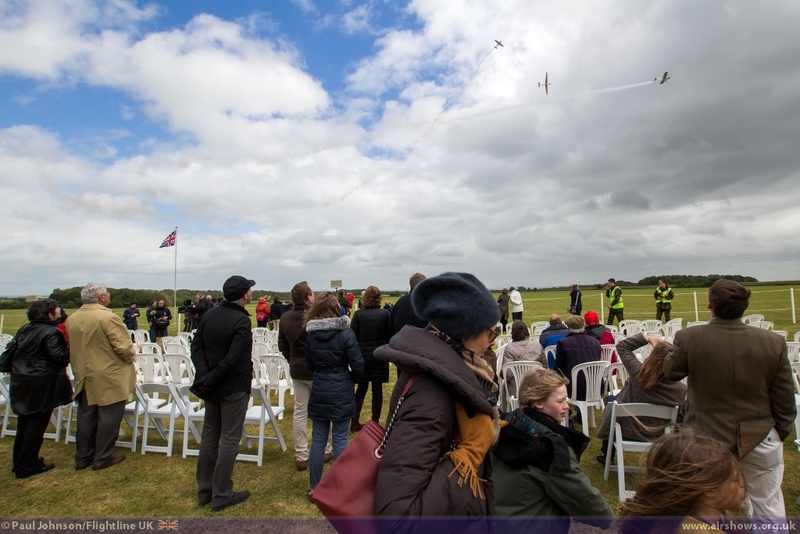 However full credit must go to the participating pilots (who had waived their display fees to support Help for Heroes) who flew in difficult conditions meaning a full afternoon of entertainment could be staged for all the guests. 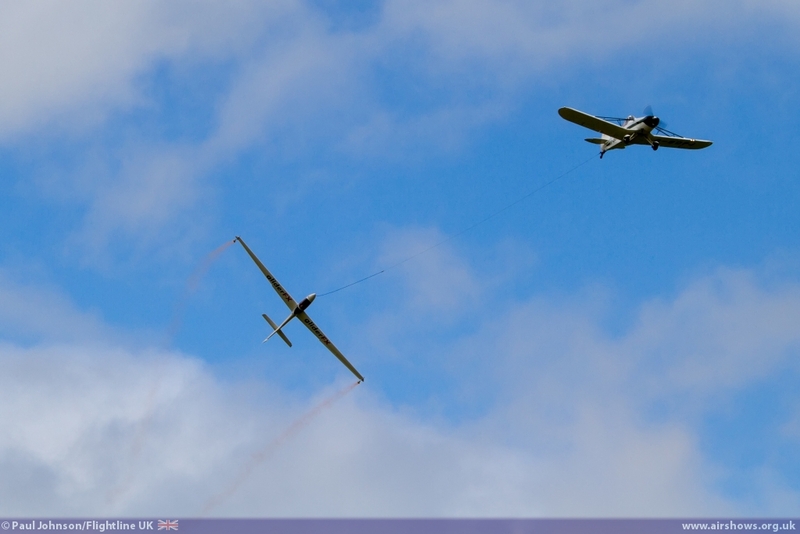 The full sized flying display got underway after lunch with Peter Scandrett’s Rendcomb based Bucker Jungmann. 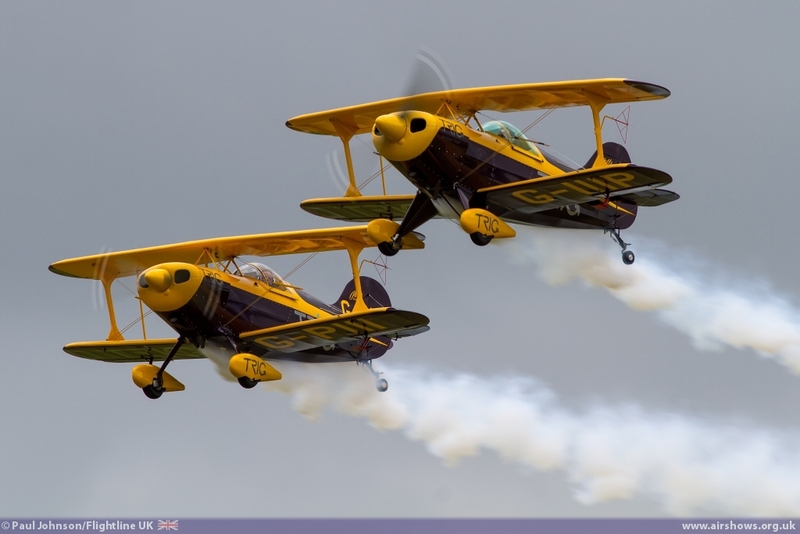 Peter is perhaps best known on the display circuit as a member of the Yakovlevs Display team which fly a mix of Yak-52 and Yak-50 aircraft. 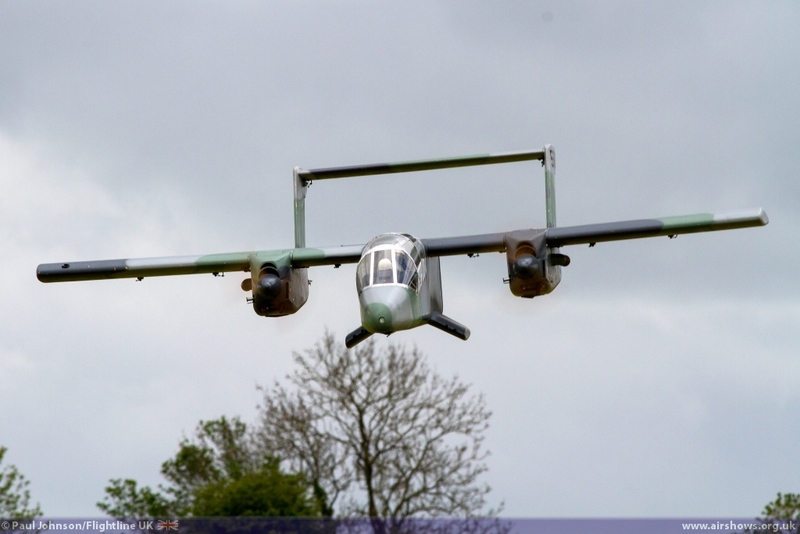 Like many Jungmann aircraft currently airworthy, Peter’s example is actually Spanish built CASA 1-131E. 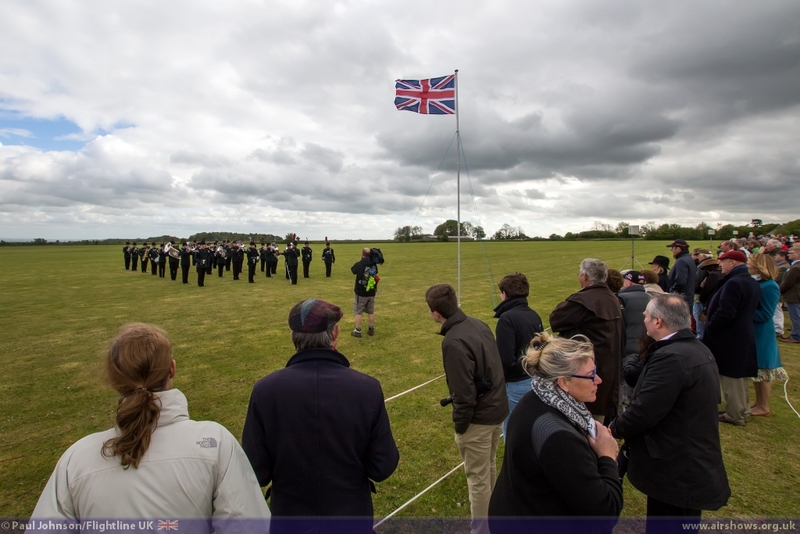 Despite the winds Peter put on an elegant routine that brought the guests out of the tents to watch the flying display. 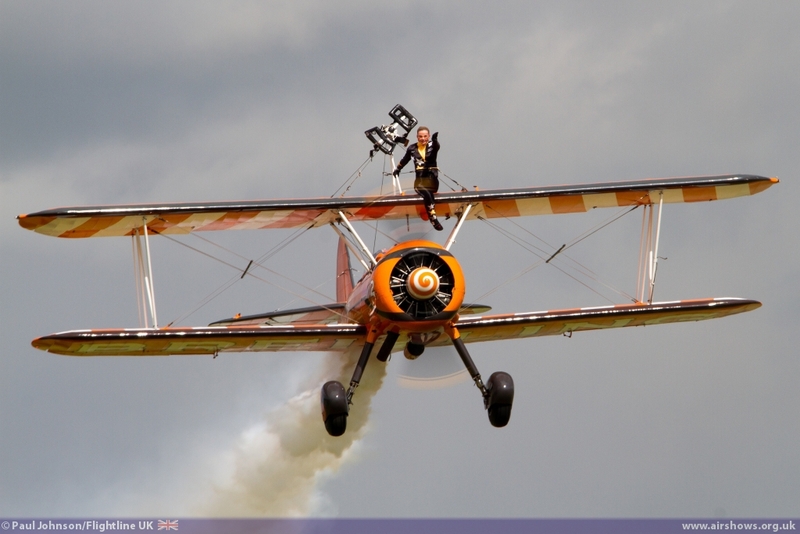 The Jungmann was followed by much more modern aerobatic machinery. 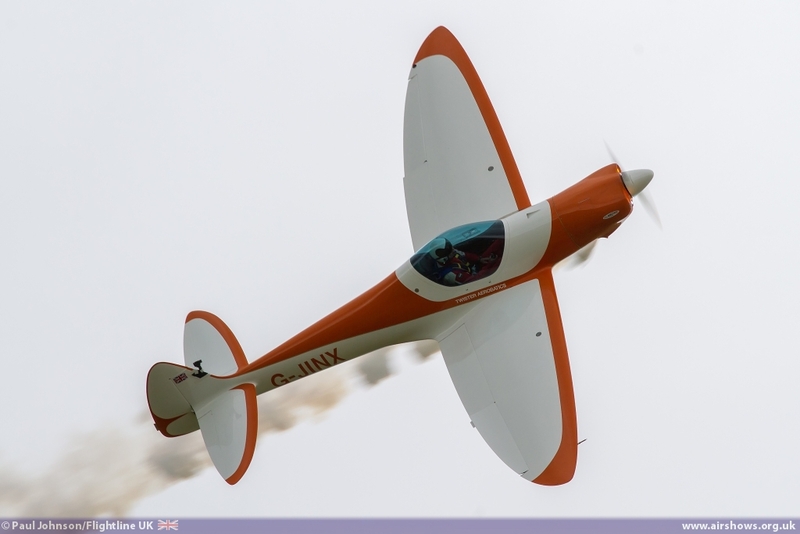 The Twister Duo have returned to the display circuit this year with a new aircraft, G-JINX flown by Guy Westgate, joining the more familiar G-SWIP flown by Peter Wells. 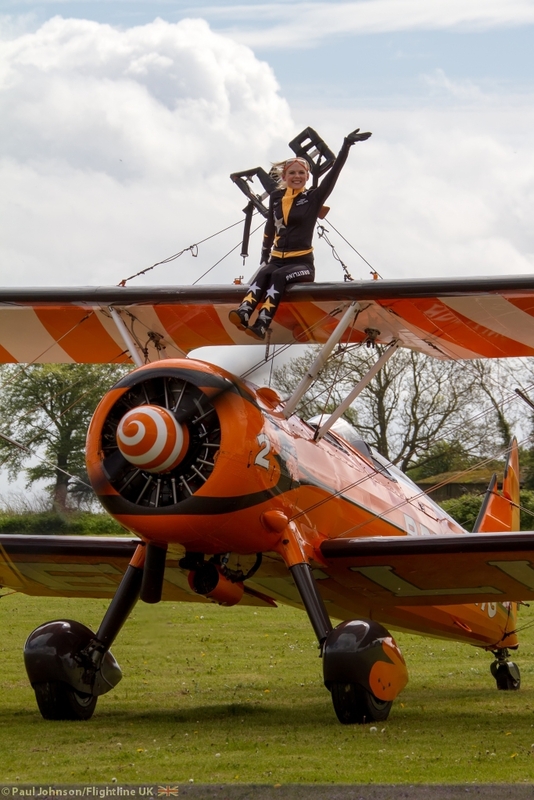 The team have had an interesting winter joining other British teams including the Breitling Wingwalkers in the Middle East performing in Abu Dhabi and Bahrain. 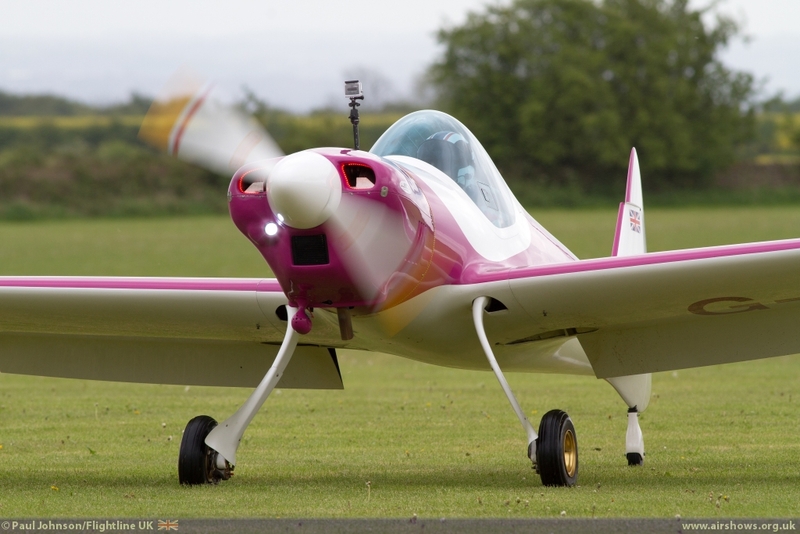 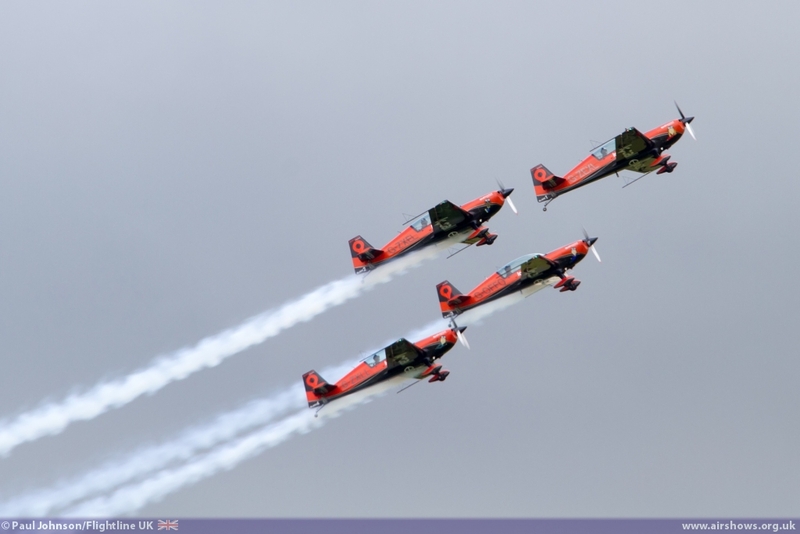 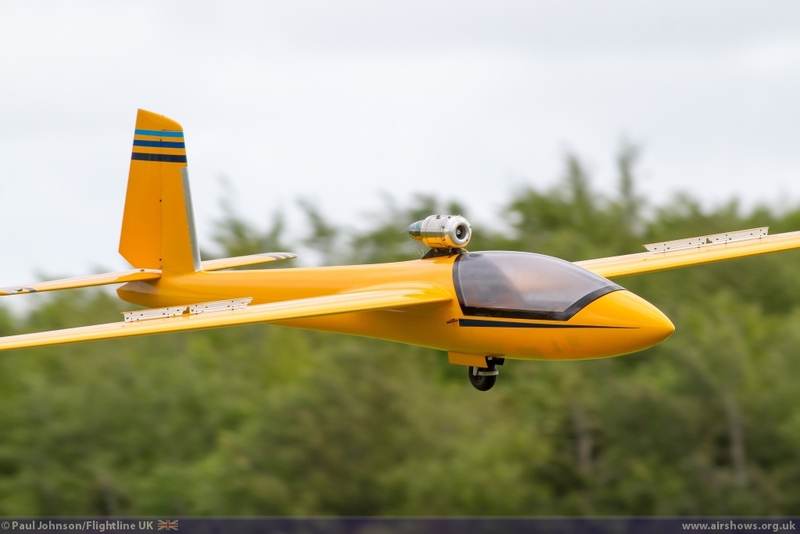 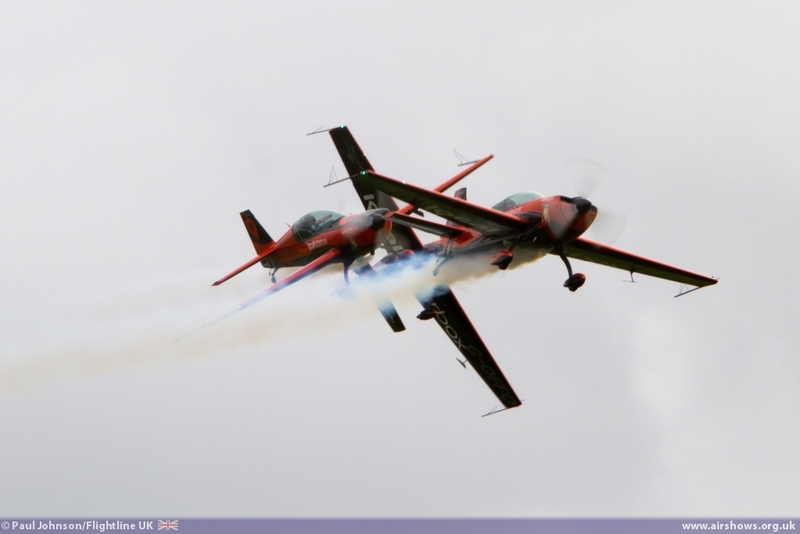 Following on from the Twisters were the Blades flying four Extra 300LP/330LC aircraft. 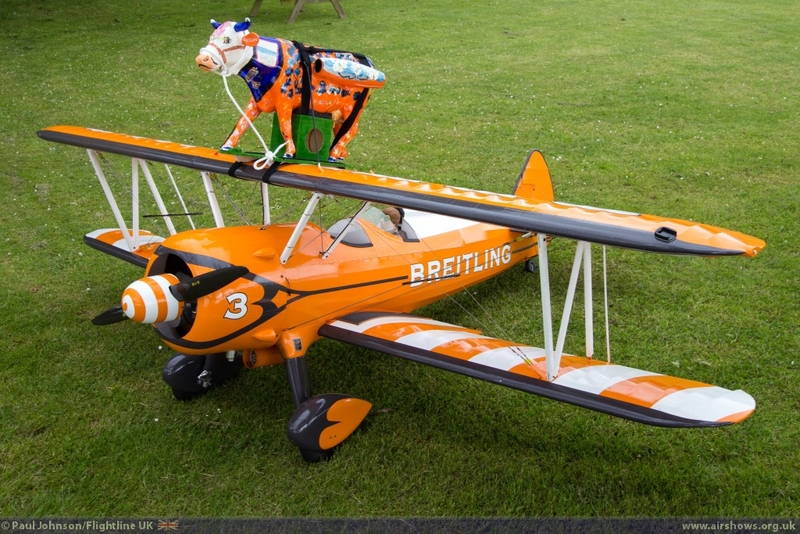 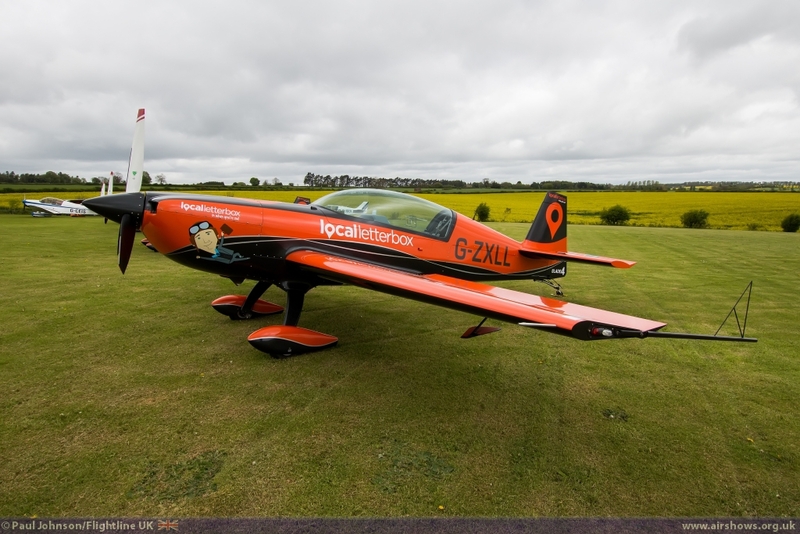 The team have retaining their distinctive orange and black colour scheme for 2014, but have gained the sponsorship of LocalLetterBox.com with company’s logo and cartoon characters featuring on on the aircraft. 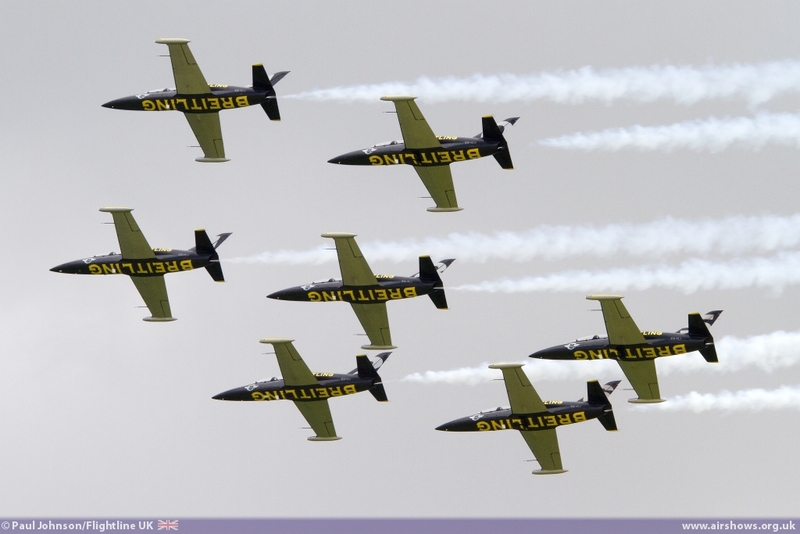 The Blades have added some new tweets to their display this year to keep their display fresh. 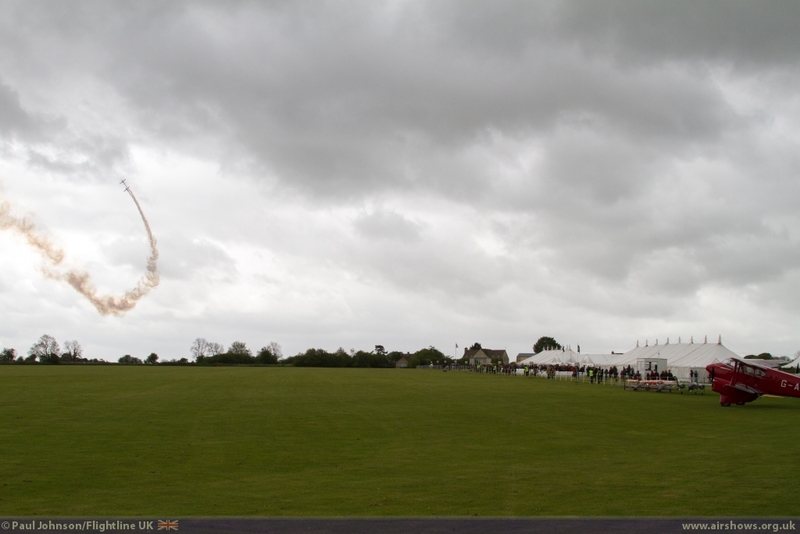 Both teams put in excellent performances in the gusty conditions under threatening backdrops. 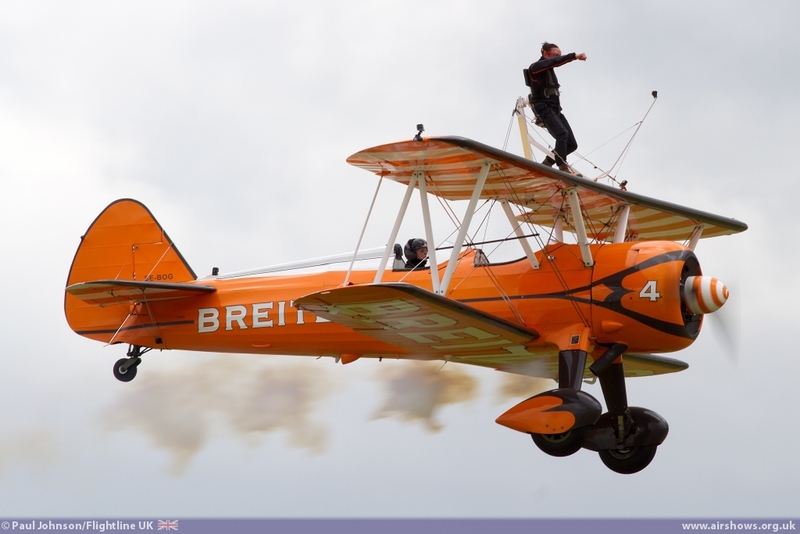 The first appearance of the ‘home team’ was not all it seemed with a number of BBC camera crews setting up around the airfield to catch the display of a solo Stearman from the Breitling Wingwalkers. 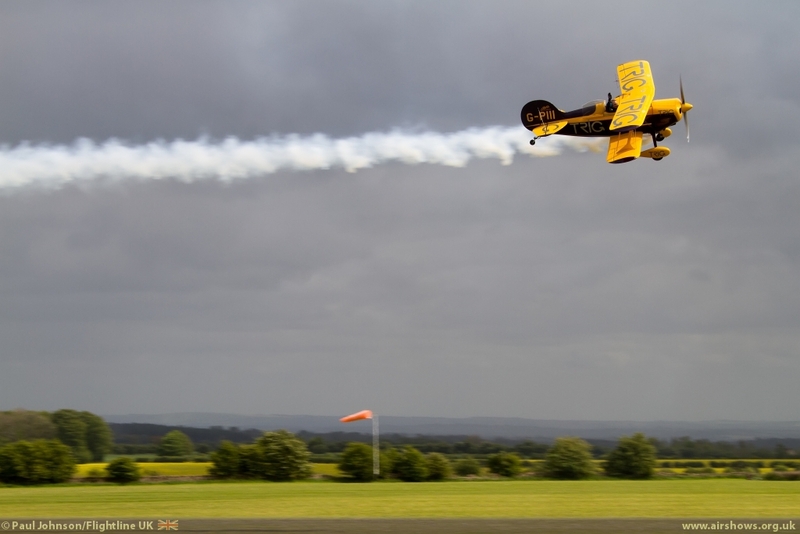 The wingwalker was Richard Hammond and one of Top Gear’s infamous challenges had ended up at Rendcomb with him on the wing of a Stearman with Jeremy Clarkson and James May watching from their own “unique” picnic amongst the classic cars! 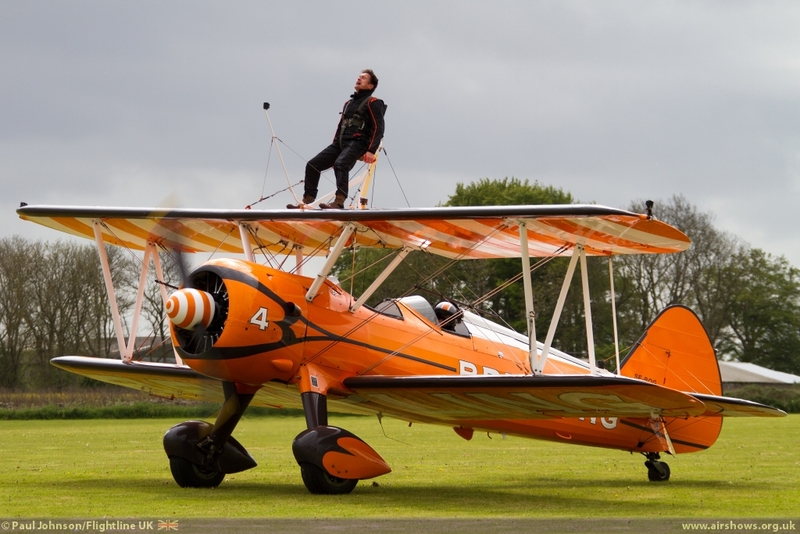 Richard certainly experienced a full-on Wingwalking display with team leader Vic Norman performing some aerobatics for the camera crews and crowd before some more gentle low passes. 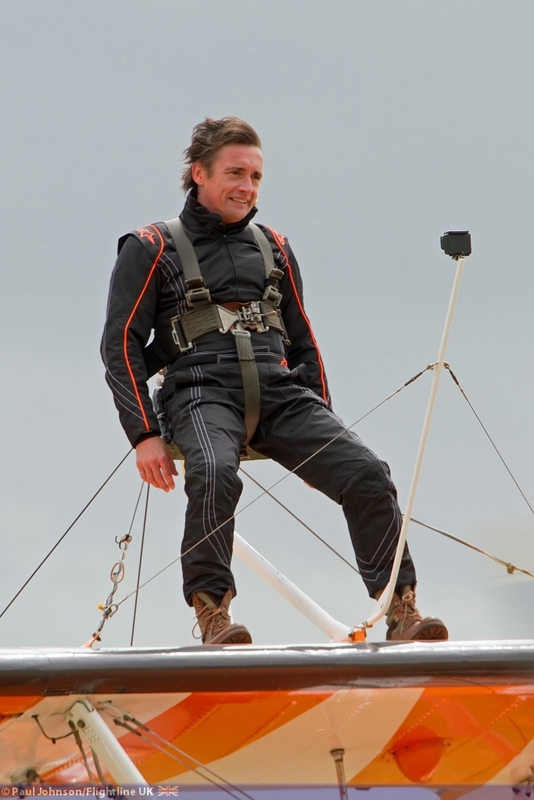 The facial expressions once he had landed said it all about the range of emotions he experienced during his flight! 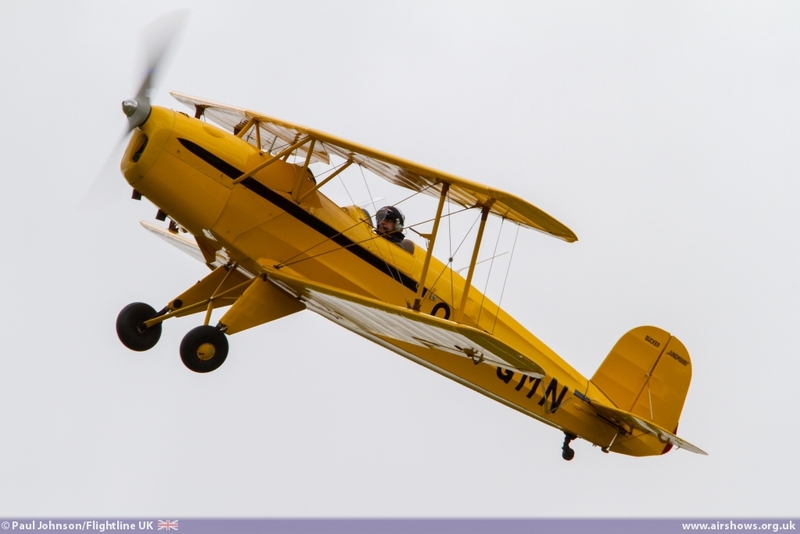 The flying display continued with another based biplane – this time the beautiful lines of de Havilland DH90 Dragonfly G-AEDU. 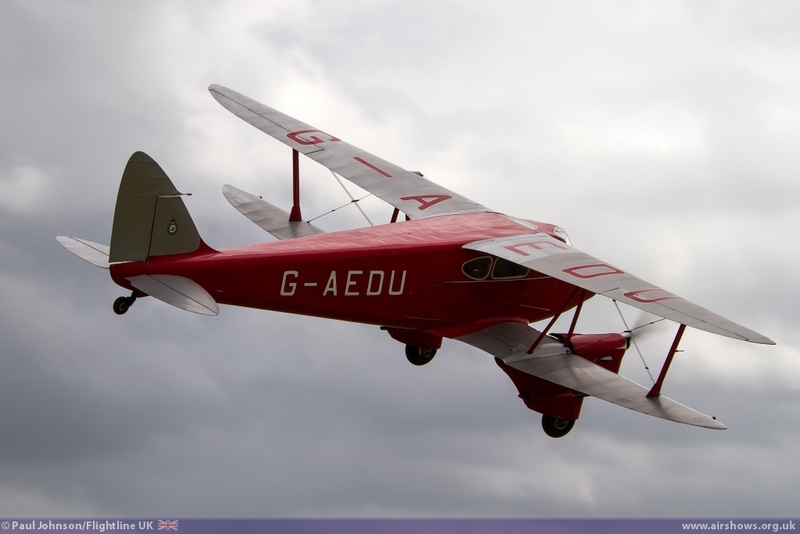 While in general appearance the Dragonfly appears similar to the Dragon Rapide, it has more swept-back wings and shorter lower wings. 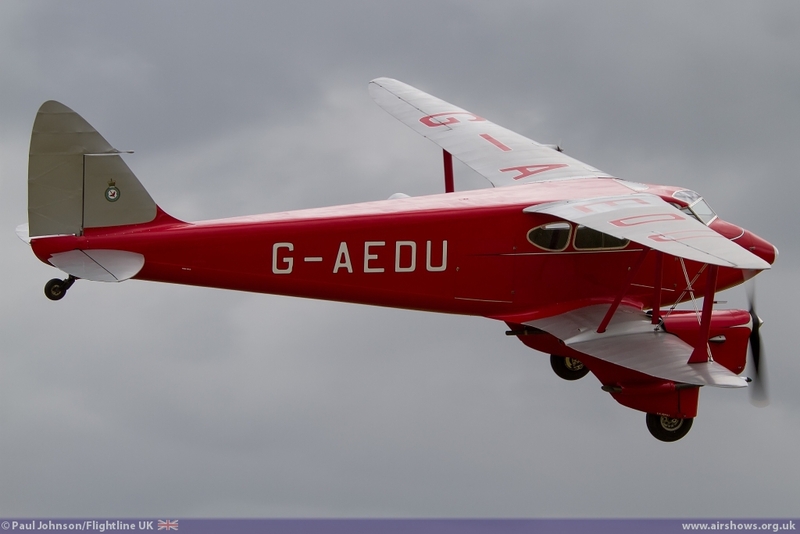 Rather than serve as an airliner, the Dragonfly was a luxury touring aircraft but like the Rapide many ended up in military service during the Second World War. 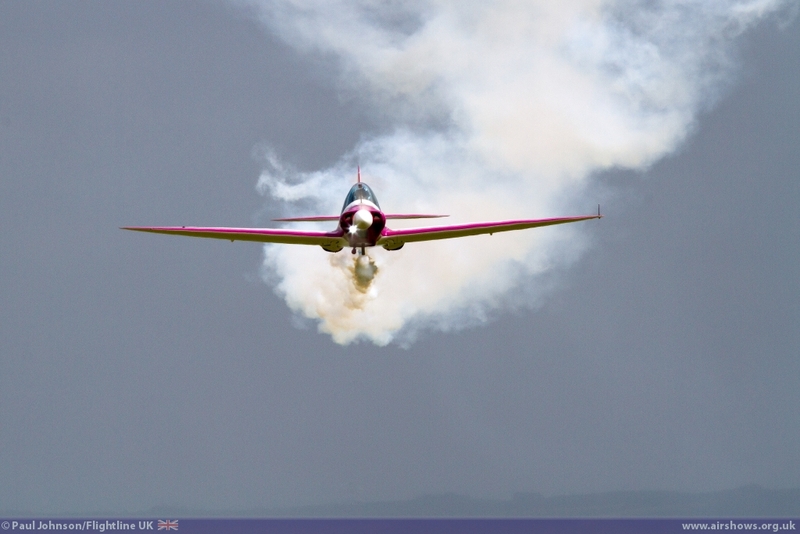 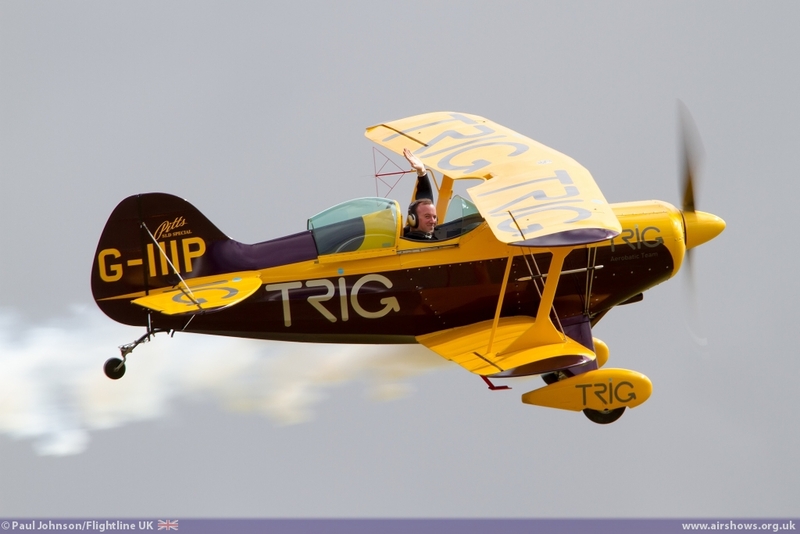 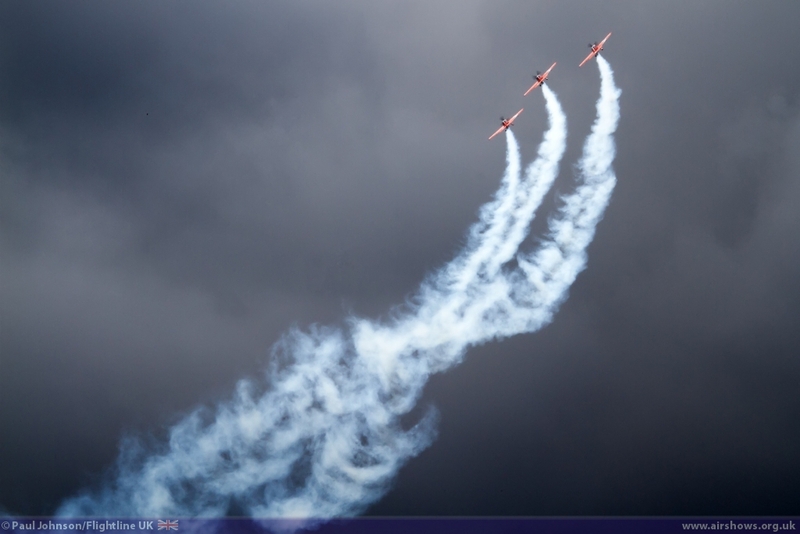 Further aerobatic antics came from the TRIG Aerobatic Team with Richard Grace and Dave Puleston. The TRIG team put on a very fast paced and close formation display highlighting the excellent qualities of their Pitts Specials which stood well lit up by the sun against the dark clouds behind. 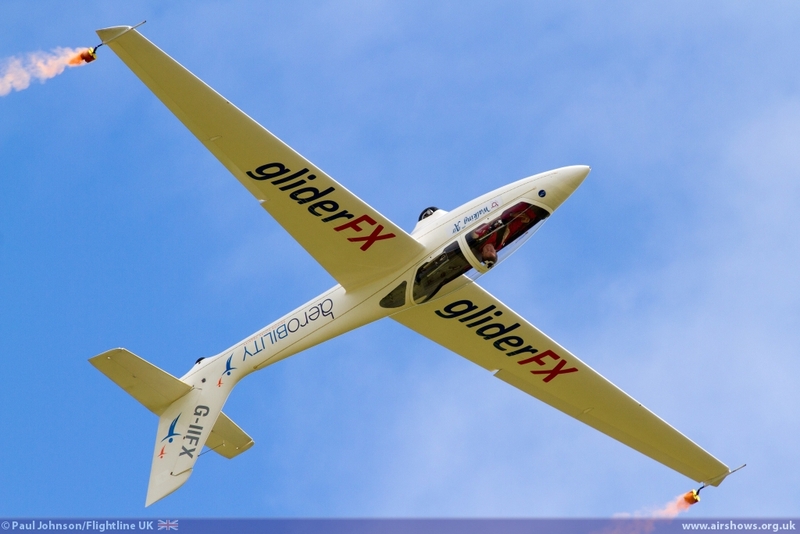 GliderFX followed with another “one-off” just for Rendcomb. 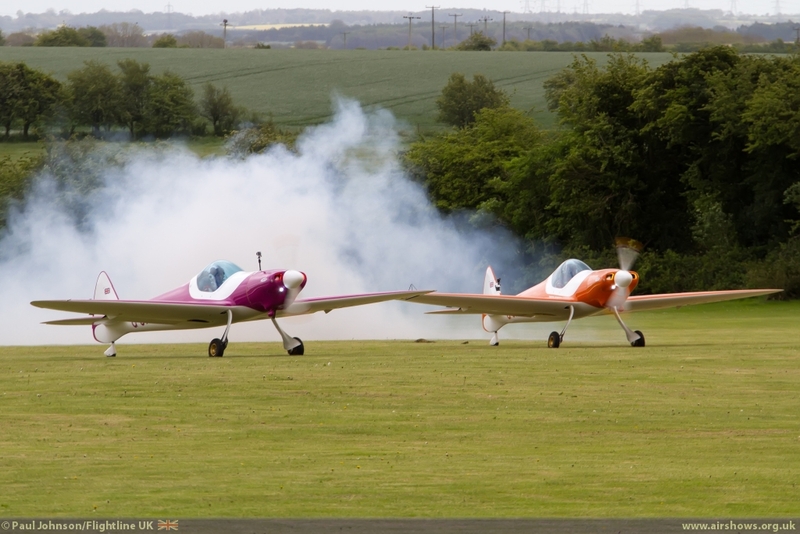 Since the Twisters have been performing as a duo, the solo Twister has not been part of glider display that was so popular a few years ago. 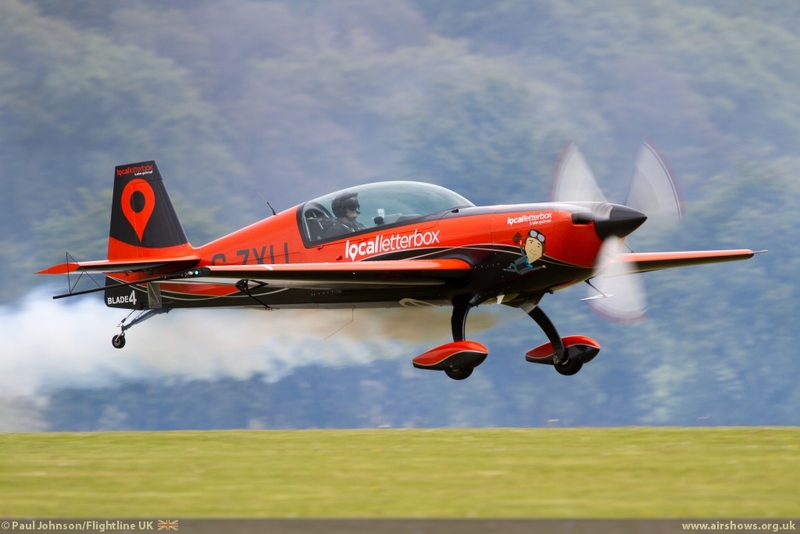 However for this show they were reunited with the Twister flown by Pete Wells barrel rolling around the combination of Fox Glider flown by Guy Westgate and the Piper Pawnee flown by Ian Gallacher. 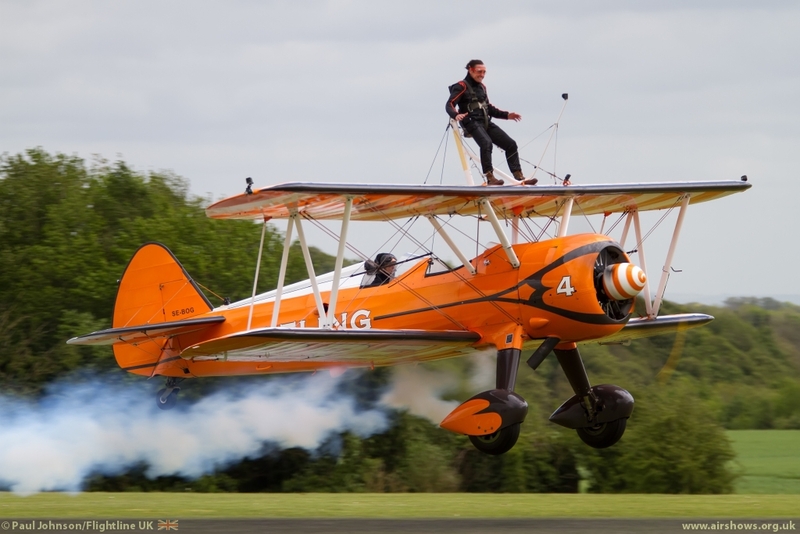 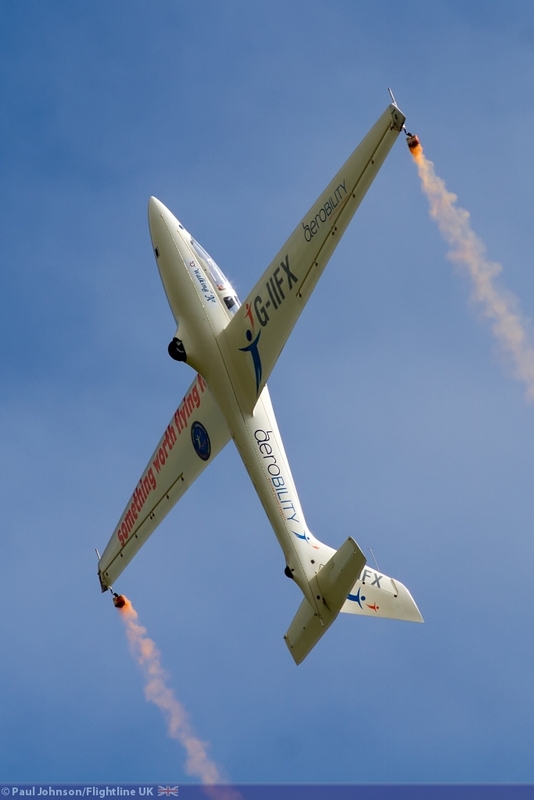 Pete then performed his traditional solo display climbed to height before Guy released from the tow to perform his usual amazing display of glider aerobatics with delicate lines of orange smoke trailing from the gliders wing-tips. 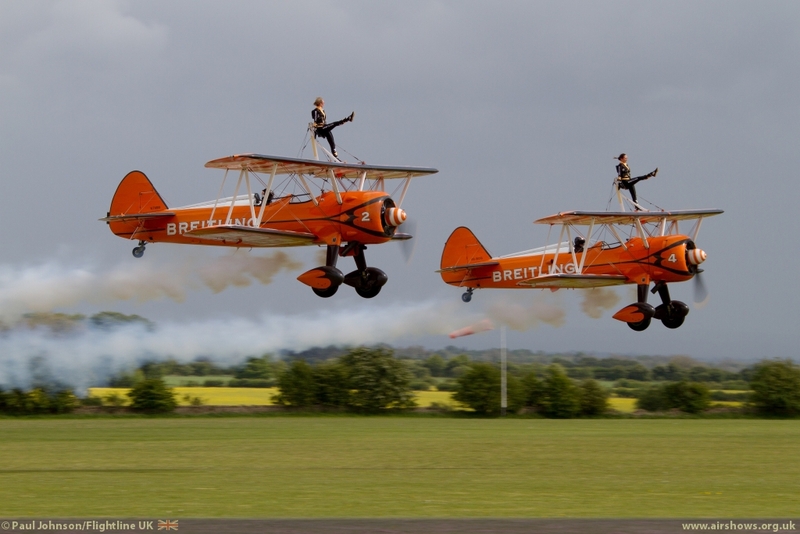 The Breitling Wingwalkers may have been the “home team” and one that is often a regular sight of this part of the Cotswolds but the crowd still really enjoyed the display by Dave Barrell and Martyn Carrington with Danielle Hughes and Freya Paterson on top of the wings. The combination of the rasping engines from the aircraft, beautiful Breitling colour scheme and the daring girls on the wing is always a head turner at any show, but it is always particularly special to see the team in action at their home base! 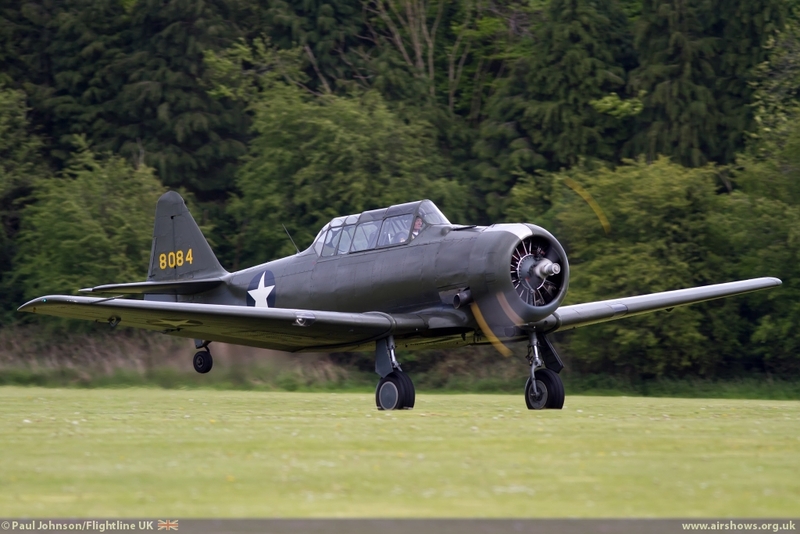 The final piston powered acts had a “North American” theme. 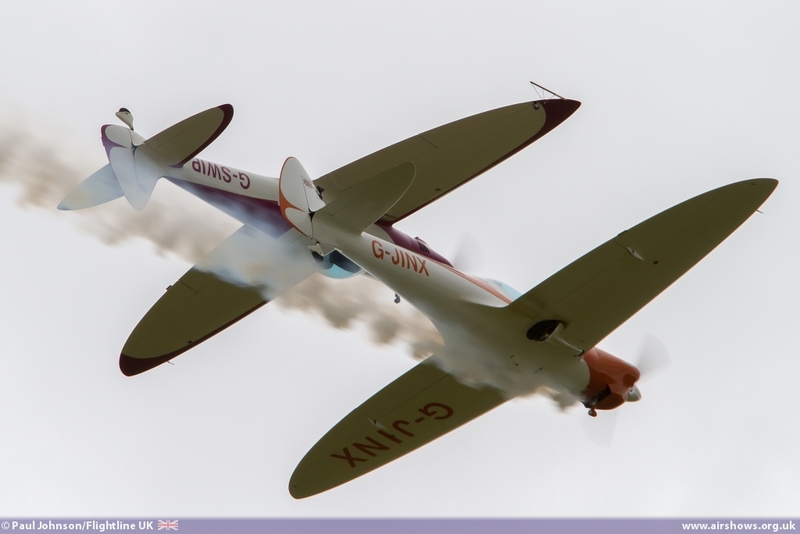 Peter Teichman has been sue to display his Spitfire, but the winds at North Weald were out of limits. 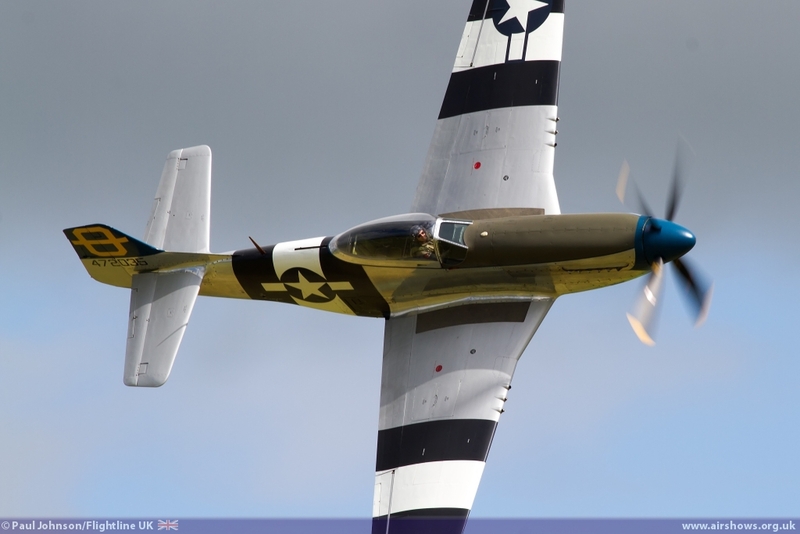 Not to be deterred, Peter substituted his Mustang instead and put a very smooth and flowing display of loops and rolls over Rendcomb before departing back home. 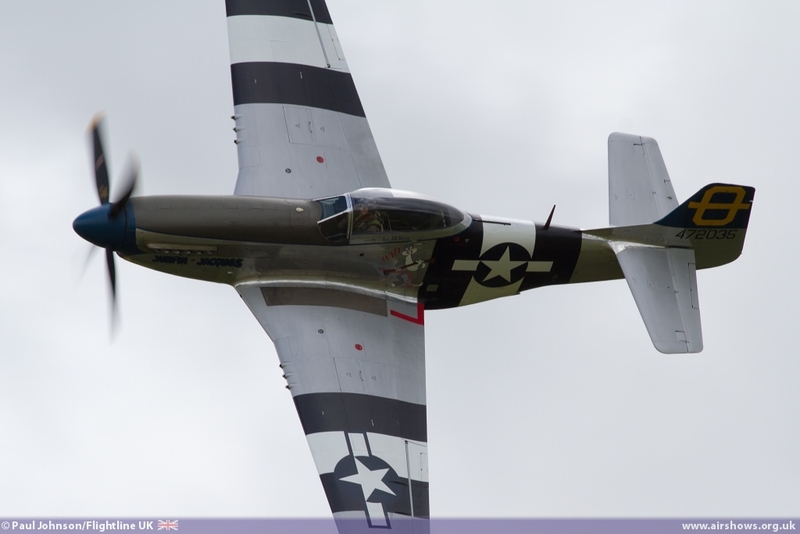 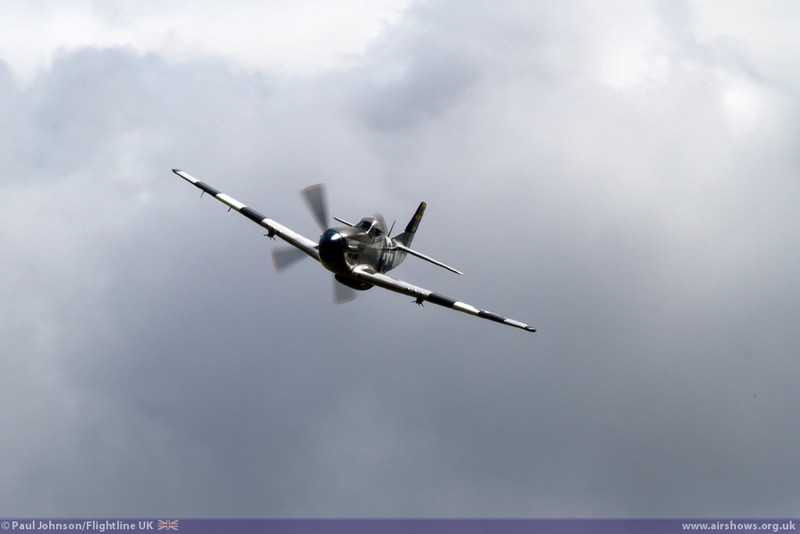 Another famous North American product, the T-6 Texan followed the Mustang. 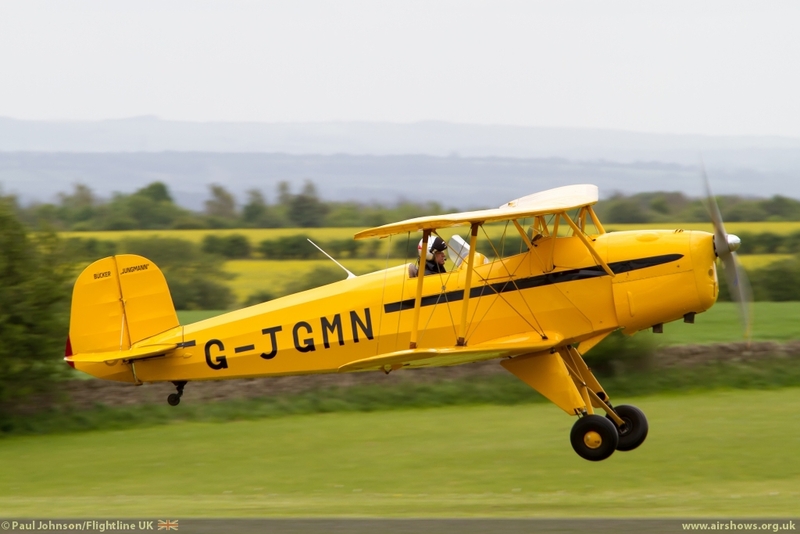 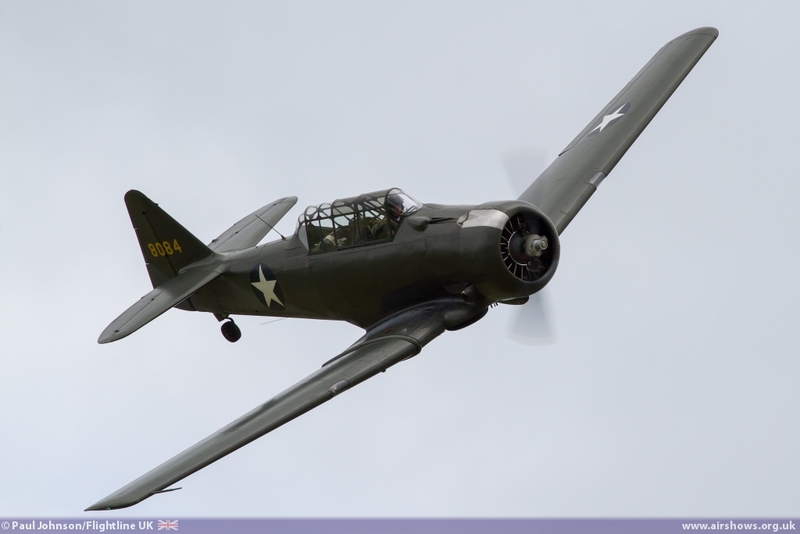 Despite a light shower blowing through, John Beattie put on a lovely display in Kennet Aviation’s Texan making full use of the short crowd line to show off the aircraft. 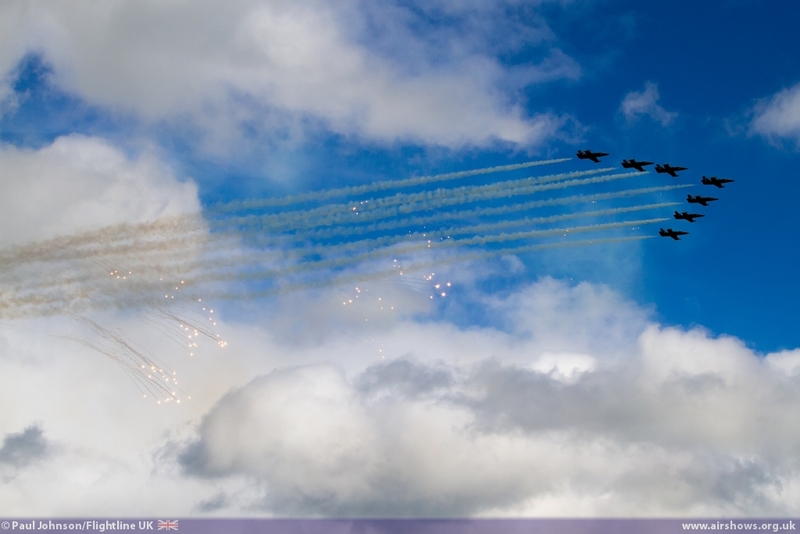 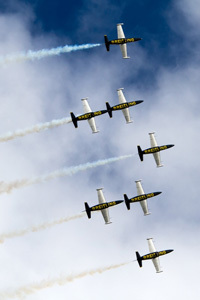 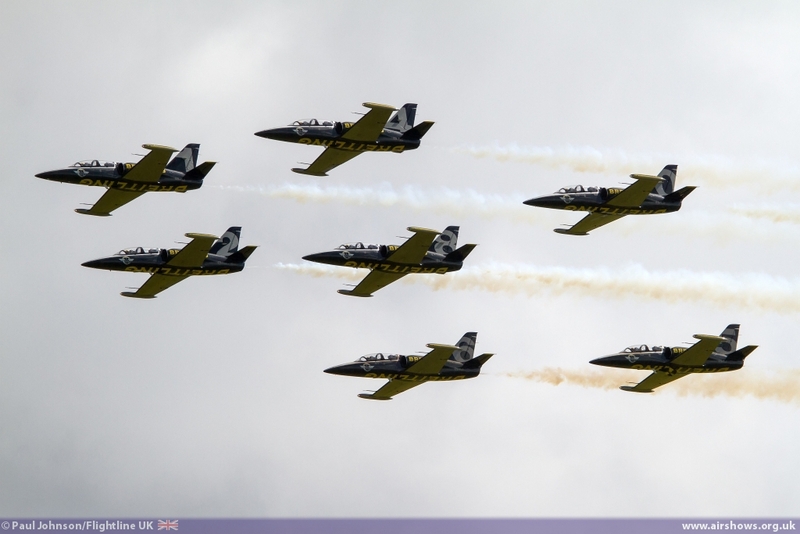 The big finale to the flying display was a display by the Breitling Jet Team. 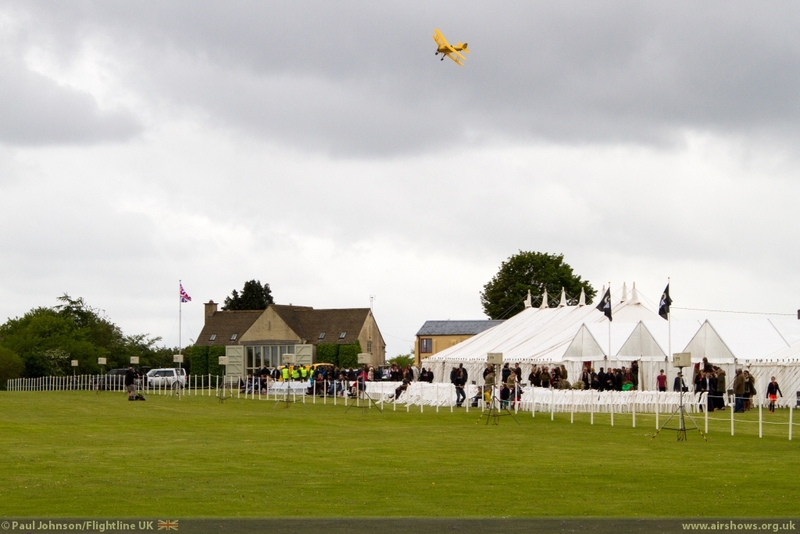 The poor weather the day before had delayed their arrival to nearby Kemble until the day of the show. 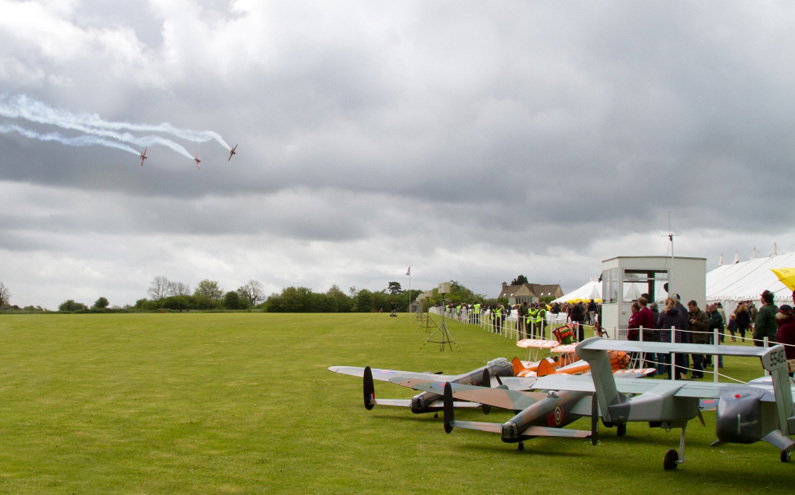 However they arrived on time to close the display through the clearing grey clouds. 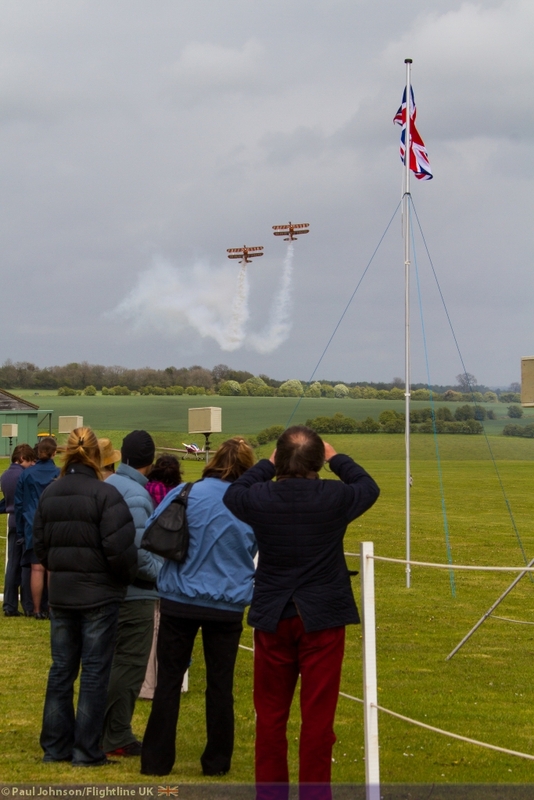 The bumpy conditions caused by the string winds restricted their display somewhat but seeing a big jet formation display in such a tight area is always an impressive sight as was the team final flare-release on their way back to Kemble. 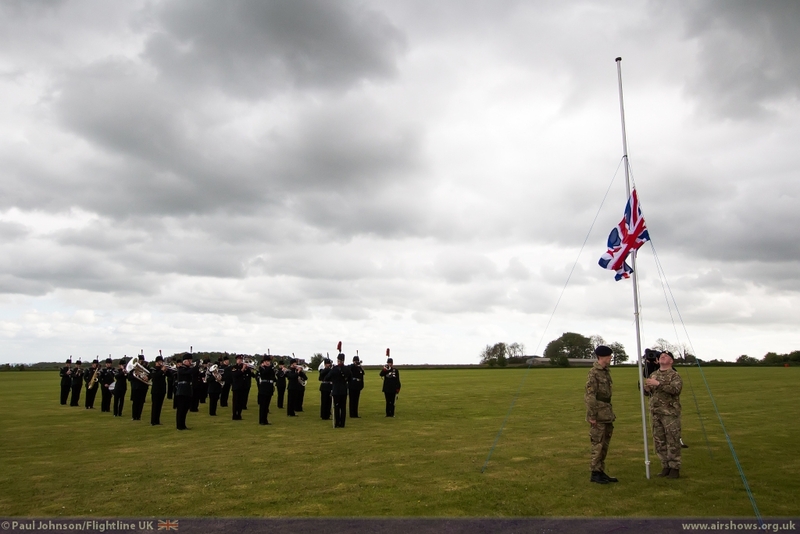 The event was brought to an end with a traditional “Last Post” ceremony. 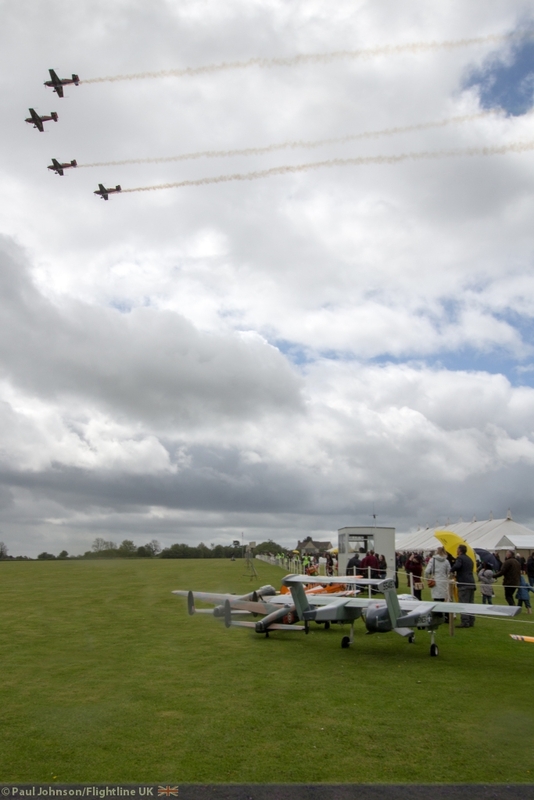 Despite the typically “unsettled” British weather, the Heroes Airshow was a superb day with varied and exciting flying displays and we hope it raised plenty of money for Help for Heroes and the other charity the event supported. Our thanks must go to Martyn Carrington, Vic Norman and all at AeroSuperBatics.